Each year Verisys supports SheTech Explorer Day, by sponsoring women leaders from their company to attend and mentor high school girls 9th through 12th grade at this hands-on tech conference. The day-long event includes workshops in science, technology, engineering and math (STEM). The goal is to expose girls to technology in a fun atmosphere, as well as meet STEM role models to learn more about opportunities in those fields. The girls participate in interactive sessions where they get to experience technology such as robotics, computer programming and digital media. 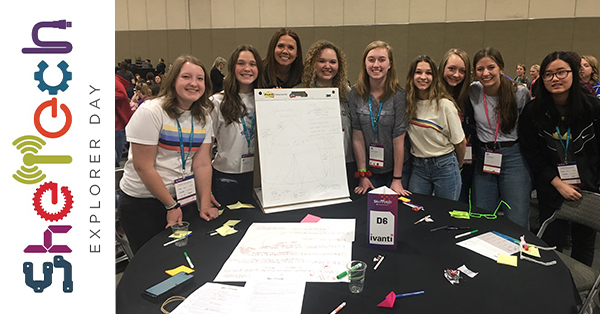 Juliette Willard, Verisys Marketing Specialist, was one of 230 mentors who assisted over 2500 high school girls in the SheTech TechChallenge in Sandy, Utah on April 9th. This year’s challenge was focused on Puerto Rico and the aftermath of Hurricane Maria (loss of their power grid, 95% of cellular phone networks down, and less than 50% of residents had clean, drinkable water). The girls were asked to build a technology solution to help people in a natural disaster. Nine girls joined Juliette’s table for the challenge. While eating lunch together, they came up with fun nicknames to remember each other by. A few of these were: Mona Lisa, Dr. Quinn Medicine Woman, Ryan Reynolds, Brooklyn Bridge and (done singing) How do you solve a problem like Maria? Once they established names and learned each girl’s superpower, they dove into solving the challenge. The girls brainstormed, writing out all of their ideas, then narrowed them down to just a few key points which were discussed in more depth.